The great cryptocurrencies bull market resumes is what we wrote several weeks ago, and we flashed a BUY alert to our premium subscribers. Today, we are on record calling for a screaming BUY opportunity for investing in cryptocurrencies until 2020, this is why. The long term bull market is nicely in tact. The recent breakout of the strong sell off is over. As long as the price of the top 8 remains in the pattern annotated on the chart the great bull market goes on. We have updated the chart, and embedded it below. The only thing we conclude during the ongoing ‘retracement’ is another opportunity to enter, nothing more nothing less. Some of our premium subscribers are reaching out to us, asking what is going on with cryptocurrencies because of the recent retracement. Looking at the chart below we would argue that it is nothing more than a small blip, an entry point, more than anything else. This cannot be compared to the real retracement in January and February of this year. Let’s get things straight: as long as cryptocurrencies remain in the pattern that you see on below chart they are in great shape. Every time they come close to the lower area of the channel it is a BUY opportunity. Regardless of how long the ongoing retracement may take, even if it turns out to be a consolidation, it is important to stay focused on the overarching trend, and that one points to higher prices until proven otherwise. Yes, we are still convinced that our Bitcoin price forecast of 50,000 USD is still accurate, again, until proven otherwise. 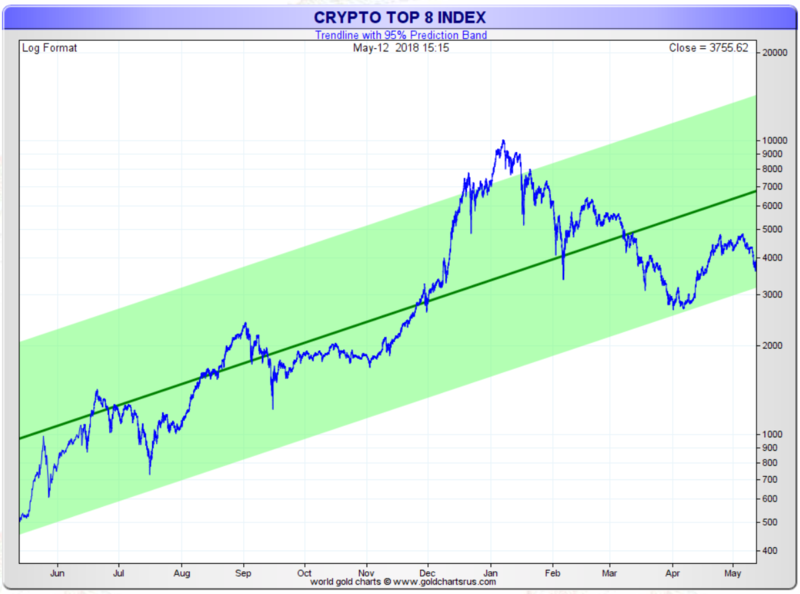 See our Bitcoin (BTC) chart. Note that even in February of this year, when all cryptocurrencies like Ethereum (ETH) and many others, without any exception, crashed in the 70 to 80 percent range, we remained focused on our method, and concluded the following Cryptocurrencies in 2018: Long Term Bull Market Still Intact after we wrote this piece in January Cryptocurrencies: a Sea Of Red or a World of Opportunities. The returns between now and 2020 can be amazing for long term cryptocurrency holders, provided they have chosen the top quality names. Although the potential profits are amazing, there is also ample opportunity to lose big time with cryptocurrencies. Think of cases like TenX coin, that has been falling relentlessly, also in terms of market cap. Choosing top quality names in cryptoland is imperative. Interestingly, we were quite sure to have found an amazing Cryptocurrency Tip, The Next Ripple, and, so far, it has been proven right, both from a chart perspective as well as from a fundamental (value) perspective. We have designed a method which allows to find the perls among cryptocurrencies. After many hundreds of hours of research we are convinced this method works well, and results are being delivered ‘as we speak’.